← Beautiful tree-lined road at Cathcart (near the Grampians) in VicRoads’ firing line. This story appeared in The Age on November 16, 2015, journalist is Adam Carey. It has been called “the most dangerous intersection anywhere in Victoria” by a former premier, a black spot 20 minutes south of Bendigo on the Calder Highway that has seen six serious crashes, two of them fatal, in the past six years. There is hope the death of a 30-year old man last year will be the last at Ravenswood, with work beginning this month on the construction of an $86 million circular interchange unique to Victoria that will make the intersection much safer. But VicRoads has come under fire about its environmental management of the project, after it again seriously underestimated the number of native trees it will have to fell. Almost 1900 native trees will be cleared to make way for the sprawling interchange, the roads authority recently revealed, almost double the 1000 trees it had long said would go. The revelation sets a pattern for VicRoads, which was widely condemned this year when it admitted it would have to destroy almost 900 towering old trees to widen a 41-kilometre stretch of the Western Highway. Environmental approval for the project was given on the information that 221 large old trees would be felled. The environment around Ravenswood is a mix of bushland reserve with many mature eucalyptus trees and farmland. There was no environmental effects statement for the project, which is being part-funded by the Commonwealth, but VicRoads strongly defended its commitment to preserving as many trees as possible, while stating the intersection’s tragic crash record could not be ignored. The initial estimate of 1000 trees was based on aerial images and did not include smaller trees obscured from view beneath the canopy of large trees, Mr Merritt said. A more recent count by independent ecologists in February identified that 1875 trees would have to go. Mr Merritt said after the interchange is built in 2017, VicRoads would revegetate the site with 8100 trees, shrubs and grasses. But that figure was condemned as “weak” by the Victorian National Parks Association. 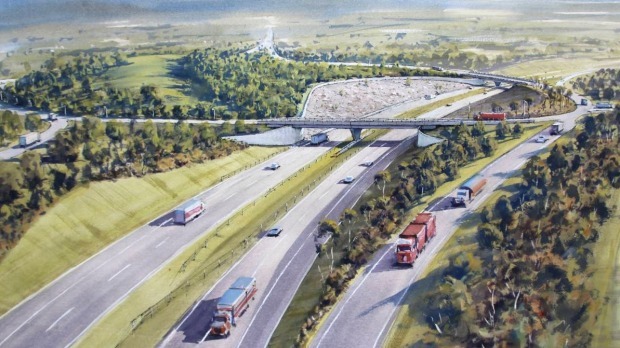 It considers it an example of how government authorities such as VicRoads are allowed to meet softer targets to offset the environmental damage of their projects than private companies must abide by. “We think that the government agencies should be doing better and should be held to account, more along the lines of what private landowners are required to do,” said Yasmin Kelsall, the association’s habitat campaigner. A review of Victoria’s native vegetation laws is due to be completed early next year. However, there is encouraging evidence VicRoads is willing to find ways to reduce the environmental damage of its projects, if road users are also willing to accept a cut to the speed limit. In recent weeks it changed its proposal for a road widening project in Rushworth in northern Victoria that would have killed 100 trees, after the authority met with community anger. A third of those trees will be retained in the new design, which reduces the road’s speed limit from 100km/h to 80km/h. The lower limit means a narrower road reserve can be created. Louise Costa, a local campaigner, said VicRoads had become much more receptive to the idea of preserving the environment after talking to locals. “This is a good example of VicRoads and the local community finding a way forward which balances the need for road safety and reduces the impact on the environment,” VicRoads’ Mal Kersting said. This entry was posted in Uncategorized and tagged Calder Highway, roadside tree loss, roadside vegetation, VicRoads. Bookmark the permalink.